Working on a scrapbook with your loved one can be fun at any age, but it can have extra health benefits for your elderly loved one, especially if he or she has dementia. 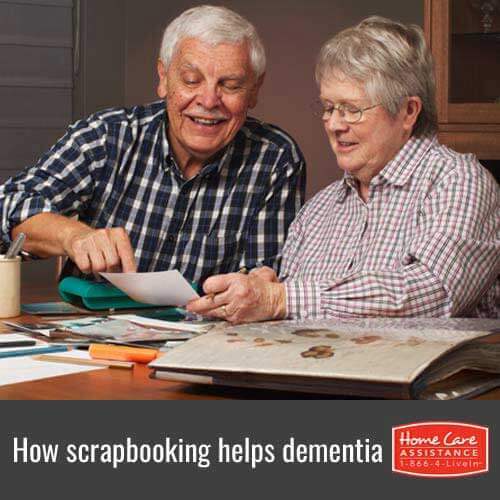 Rhode Island hourly care providers explain the benefits of scrapbooking for seniors with dementia and encourage families to participate in these projects with their loved ones. For elderly loved ones, it may be difficult to recall memories they would like to hold onto or share with you. Sorting through old photographs, swatches of fabric, cards, tickets stubs and the like can be a wonderful bridge to help jog your loved one’s memories. Help your loved one write captions of stories and special memories so he or she can look at the book later and reminisce. Working on a scrapbook can be emotionally fulfilling for both you and your senior loved one. Elderly family members treasure the time you take to spend with them, though is especially true if you are a family caregiver. Spending time doing daily tasks can make your senior loved one feel like they are a burden or like you don’t want to be with them. Taking the time to do a project and spend quality time together is rewarding and comforting to seniors. Likewise, the process of looking at new or old memories can be cathartic and help your senior loved one feel more relaxed. Current research indicates that cognitive function declines when seniors don’t continue to challenge their minds and use the information and skills they have acquired. For example, if you once played an instrument but haven’t played in years, you may try again only to discover you can’t remember how to play it. The mental acuity and thought process of working through memories to put together a scrapbook can help keep a senior’s mind active and alert. Occupational therapy helps people who experience a decline in the ability to perform motor functions, such as writing with pens or managing utensils. Working on a scrapbook with your elderly loved one is like your own in-home form of occupational therapy. Cutting, gluing and decorating the pages of a scrapbook can exercise your loved one’s dexterity. Encourage your loved one to do as many of these tasks as possible, even if you could do them more quickly yourself. Finishing a project can give a senior a feeling of accomplishment, which can make a big difference in self-esteem as well as outlook and overall wellbeing. Your senior loved one is likely to have a great sense of accomplishment each time they work on a scrapbook with you. This can be especially vital for elderly people with dementia because they often feel out of control and are unable to finish tasks, so the chance to master a project can really help. Seniors who receive Rhode Island dementia home care will experience similar benefits to the ones listed above. Home Care Assistance is a leading provider of senior care in Rhode Island, and our dedicated caregivers offer physical and emotional support to clients. We can also incorporate our patented Cognitive Therapeutics method to your senior loved one’s care plan, which incorporates a series of games and activities to sharpen mental acuity, slow cognitive decline, and promote senior longevity. Call an experienced Care Manager today at 401.284.0979 and schedule a no-obligation consultation.